I have had a passion for painting since 2004 when I started attending classes and workshops around the Cotswolds and in London at The Pastel Society. My style has evolved having had much inspirational input and guidance from a number of well-established local artists. My art work expresses my love of nature, particularly the changing perspective on the landscape and coastline through the seasons, and also the cat and bird life in my garden! Colour and texture are strong elements of what inspires me and I like the intensity of colour that is possible from working with acrylics and watercolour combined with soft pastels. More recently I have been experimenting with mixed media including collage, techniques which increase the opportunity for interesting textural effects. Recently I have become inspired by working in mosaics which has added a new dimension to my use of colour and texture. 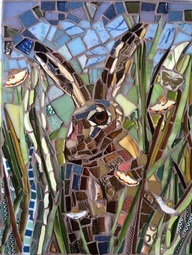 I create 2D and 3D pieces both for indoors and the garden using a mixture of media including ceramic and glass tiles, crockery, china, beads and coloured glass. Angela was born in Worcester and educated at Liverpool College of Art, Bristol University and Perugia University, Italy. She has designed for the BBC, drawn for the British School of Archaeology and taught in private and state education to A Level, as well as designing courses for Hampshire Open College Network. She has tutored in institutions such as Whitchurch Silk Mill and has taught privately. On moving to Hampshire in 1988 she taught people from nine to ninety years! Her over-riding philosophy is that the more she teaches the more she learns. Angela now lives in Burford. Although her degree is in Graphic Design Angela is a non-specialist who likes to work in a diverse range of media, including watercolour, silk painting, print-making and machine embroidery. Her love is colour and she is happy to dabble in media ranging from gouache to printing inks, taking her inspiration from natural forms, landscape, travel and architecture. She prefers to work on a smaller scale, where detail and design are paramount. She realises that it is the current vogue to specialise in one style or subject matter. As a rebel she derives pleasure from mastering one technique after another. A painting in water colour might be followed by a design executed in fine liner and then a collagraph print. This serves to stretch Angela’s imagination and technical skills. Art, to her, is a series of exercises, balancing form with colour or texture in a compositional whole. I was born in Stratford on Avon and travelled widely before coming to study and settle in Oxfordshire. While at Oxford Polytechnic in the 1980s I studied Art History and Visual Studies, working in printmaking and drawing, but never in paint. I taught myself to paint much later. My natural medium is watercolour, but I also use acrylics and inks, and love printmaking using the drypoint technique. Sometimes I use the lot all at the same time. Good drawing and vibrant colour are the cornerstones of my work. I have exhibited in every Oxfordshire's Artweeks festival since 1999. I am endlessly fascinated by the nature, science and history. I love to travel and what I encounter when I’m out and about in the world inspires my art. But there is plenty of inspiration at home in rural west Oxfordshire too. my influences include Vincent van Gogh who I've chased around the world for more than three decades, Matisse, Hockney and Dutch and Flemish 17th century artists. I raid cultures from around the world for inspiration, including Celtic, folk and African art. Recently I have been drawing and painting maps to tell my stories, and winning commendations from the British Cartographic Society for my work! Since the days we kept our own sheep to graze our ancient hay meadow in Ramsden, I have been working and experimenting with their wool, learning to weave in the process and now exhibit in several local galleries and enjoy taking part in county events and Oxfordshire Art Weeks. I provide Workshops and enjoy passing on to other interested people the traditional skills of yarnmaking, handspinning, dyeing and weaving. My background has been in administration, marketing and the furniture industry mainly, with an interest in antiques, watercolour painting, horses and carriage driving, and the countryside. I am a keen tennis player and combine this with my weaving work. Formerly FRSA MSAID. Studied furniture and interior design at High Wycombe School of Art and Design between 1954-1958. After National Service with the RAF he became Design Director of Minty Furniture responsible for product design, exhibition design, national advertising and press publicity, product photography, brochure and graphic design and all aspects relating to the public image of the company. I continued my profession on a free-lance basis working closely with other British furniture manufacturers – and when time permitted, restored antique furniture. Now in semi-retirement, I continue writing and illustrating articles for magazines usually on technical subjects showing constructional details. I also illustrate books for clients often requiring caricature and cartoon work and, in the same manner, have written, illustrated and published my own book ‘The Mot Juste’. But I generally focus on traditional landscape water-colour painting. I also use pen-ink-and-wash technique and have a preference for architectural subjects. The history of furniture and architecture are closely linked; generations of furniture makers link my family to the former and interest in the latter was triggered in school days when the study of architecture was one of several Art ‘A’ Level options. This led to further study and influenced my career in design.